35ml All Purpose (suitable for most surfaces) All purpose, liquid adhesive glue - suitable for household repairs, creative projects, cut and paste or scrapbooking projects. Convenient and mess free, goes on clear and drys clear. Non-toxic solvent and acid free, wont yellow with age. 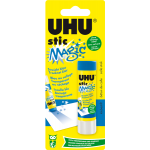 ..
50ml Fast drying paper glue in a handy pen with applicator for economical and clean glue application. Solvent free glue bonds paper and cardboard without wrinkling paper. Washes out with cold water. ..
8gm Screw Top Smooth white, solid general purpose stationery and craft adhesive glue. Convenient and mess free, glides smoothly, goes on clear and dries clear. Non-toxic solvent, acid free, won't yellow with age. 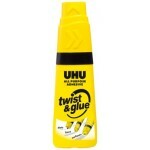 ..
21gm Screw Top Smooth white, solid general purpose stationery and craft adhesive glue. Convenient and mess free, glides smoothly, goes on clear and dries clear. Non-toxic solvent, acid free, won't yellow with age. ..
40gm Screw Top Smooth white, solid general purpose stationery and craft adhesive glue. Convenient and mess free, glides smoothly, goes on clear and dries clear. Non-toxic solvent, acid free, won't yellow with age. ..
21gm Goes on blue, but dries clear Smooth white, solid general purpose stationery and craft adhesive glue. Convenient and mess free, glides smoothly, goes on clear and dries clear. Non-toxic solvent, acid free, won't yellow with age. ..
40gm. Glue Stick, goes on Blue - Dries clear . Blue glue stick "Made in Germany" where you directly see where you glue. Applies blue and magically dries clear. With an unique screw cap that prevents glue from drying out. The glue formula consists of 70% natural ingredients (including water) an..
35ml. 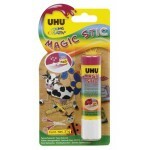 Suitable for lines, dots and surface area glueing. Solvent Free ..
19.5gm Acid Free, strong adhesive Smooth white, solid general purpose stationery and craft adhesive glue. Convenient and mess free, glides smoothly, goes on clear and dries clear. Non-toxic solvent, acid free, won't yellow with age. 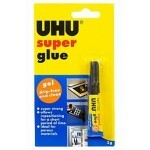 ..
3ml Super Glue Heavy duty, super strong and super fast all purpose liquid adhesive. Suitable for virtually all solid porous and non-porous materials such as china, ceramics, many plastics, wood, glass leather, styrofoam, paper and cardboard. ..
50gmRe-usable Adhesive Block. White Multi purpose mouldable, putty adhesive. Reusable again and again. For use on non-porous surfaces such as vinyl coated wall papers, painted surfaces, glass metal etc. ..
75gm Re-usable Adhesive Block. 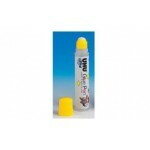 YellowMulti purpose mouldable, putty adhesive. Reusable again and again. For use on non-porous surfaces such as vinyl coated wall papers, painted surfaces, glass metal etc. ..